During these studies, my attention was drawn to the striking similarities in the properties of G-proteins with those of tubulin and actin, the major cytoskeletal elements in cells. For example, G-proteins, like actin and tubulin, are associated with the inner aspect of the surface membrane, adhering possibly both through intrinsic membrane proteins, such as receptors, and to membrane lipids. Of particular interest is the fact that all three types of multimeric proteins are subject to regulation by either GTP (G-proteins and tubulin) or ATP (actin) and their hydrolytic products (dinucleotides and Pi). Receptors regulate exchange of bound nucleotides (GDP with GTP) and act catalytically in the process. Similarly, the excursion of a single myosin molecule during muscle contraction along the chain of actin multimers is governed by the exchange of bound ADP with ATP and the hydrolysis of ATP to ADP and Pi. As stated previously, GTP-turnover (production of GDP+Pi) is essential for the rapid and sustained actions of hormones; release of bound Pi is the crucial rate-limiting process in the overall dynamics of signaling. The same is true for myosin/ actin interactions. With these similarities in structure and regulation, G-proteins can be classified as part of the cytoskeletal matrix, with the primary functional difference that G-proteins serve as chemical signaling devices whereas tubulin and actin serve as mechano-signaling devices. The release of monomers from multimers is the basis for chemical signaling by G-proteins. 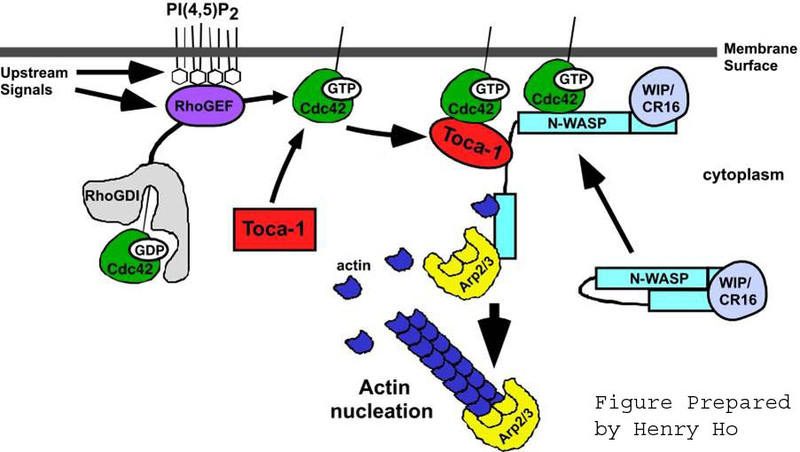 Dynamic changes in the disaggregation-aggregation cycle of actin and tubulin multimers are also regulatory devices designed for regulating the interactions or movement between specialized components of cells. Based on evidence accumulated over the past decade, all three types of cytoskeletal proteins are connected in some manner to a variety of signaling systems that adhere to the cytoskeletal matrix, including heterotrimeric G-proteins, so-called small molecular weight G-proteins, protein kinases and phosphatases, and other proteins or systems that communicate between the surface membrane and the interior of cells. These components form web-like structures that possibly interact in a flickering manner in response to activation of membrane receptors, including those that are growth promoting. This is particularly fascinating given the recent breakthroughs in understanding the functional basis of memory formation that point to a physical change in the shape of the synapse (i.e. a cytoskeletal response to a neural action potential) as well as some of the molecular machinery that keeps the synapse in this configuration. My next blog will dig into what is currently known about how memories are formed in more depth.